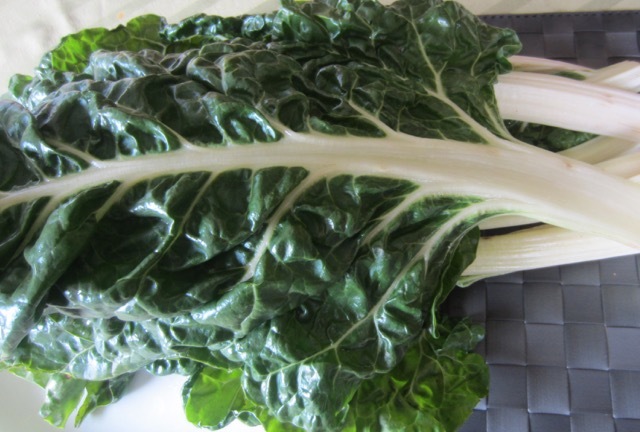 Swiss Chard is also called Chard, Leaf Beet, Silverbeet, Seakale beet, White Beet, Spinach Beet or Crab Beet. In Africa, it’s simply called spinach. It’s a cultivated variety of the species Beta vulgaris. Other cultivated varieties of Beta vulgaris include :Beetroot, Sugar beet, Spinach Beet and Fodder Beet. It’s a biannual, popular around the Mediterranean, especially in Provence and Nice and in Catalonia. Swiss Chard produces large leaves with fleshy stalks (midrib). They leaves are usually dark green, and wider and flatter than beet greens. They can also be reddish in colour. The leaves are highly nutritious. They taste like spinach but are coarser in texture. The fleshy stalks (midrib) also vary in colour, and can be white, yellow or red, depending on the cultivar. There are several cultivars of Swiss Chard including the green forms, such as ‘Lucullus’ and ‘Fordhook Giant’, as well as red-ribbed forms such as ‘Ruby Chard’ and ‘Rhubarb Chard. In Europe, the stalks and leaves are cooked separately in different ways. The stalk is considered the best part of the plant. In Africa the whole leaf blades are usually prepared with the stalks as one dish. In some countries the fleshy midribs are discarded and only the leaves are cooked. Unless Swiss Chard is young, the stalks are often separated from leaves and cooked as you would, asparagus. The stalks (midrib) of Swiss chard are eaten boiled while the whole leaf blades are sautéed and eaten like spinach. 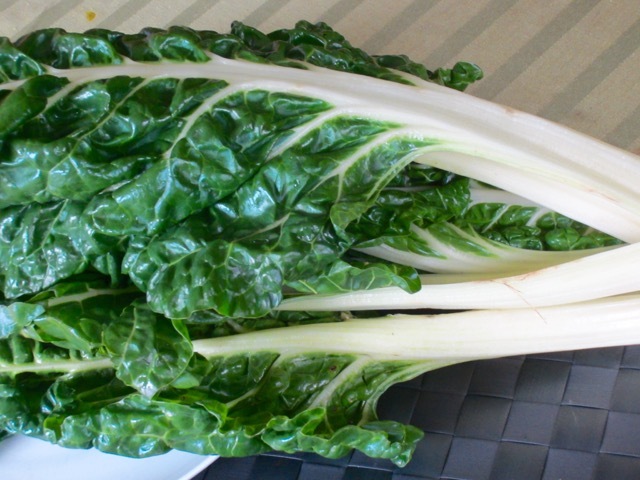 The slight bitterness of Swiss Chard fades with cooking, leaving a refined flavour which is more delicate than that of cooked spinach. Fresh young chard can be used raw in salads. Bake the stalks and sprinkle with cheese and breadcrumbs. Cook chard leaves together with scrambled eggs for breakfast. Add Swiss chard to soups in the last few minutes of cooking. 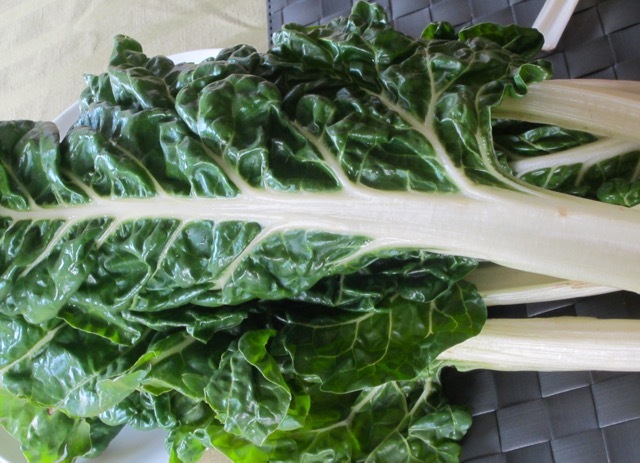 Raw chard is extremely perishable and is best consumed fresh. Put it unwashed in a perforated plastic bag. it will store in the fridge for up to 5 days. I love the rainbow chard that’s available during the summer farmer’s market. I make a sweet/sour recipe and add onions, chopped apple and bacon. It’s delicious! That sounds really delicious. I love all those ingredients. Have a pleasant week! It will keep in the garden all winter, only going to seed in the spring. I cook the stems and leaves together and often add a white sauce with cheese and spice. That must taste absolutely delightful. I love white sauces! Growing up, we’d call it spinach and we’d assume this is what Popeye was eating out of a can. I like nice fresh silverbeet so I can run a sharp blade down the stalk and cleanly get the green leaf off each side and then wilt it in butter. We used to call it spinach too. It’s called spinach in a lot of countries. I love swiss chard so versatile!